We were out at 7:15AM and arrived at Yacht Haven RV Park and Marina at 1:00PM. Checking in at the Bahia Mar where TrawlerFest is held, I then had a chance to see the boats. 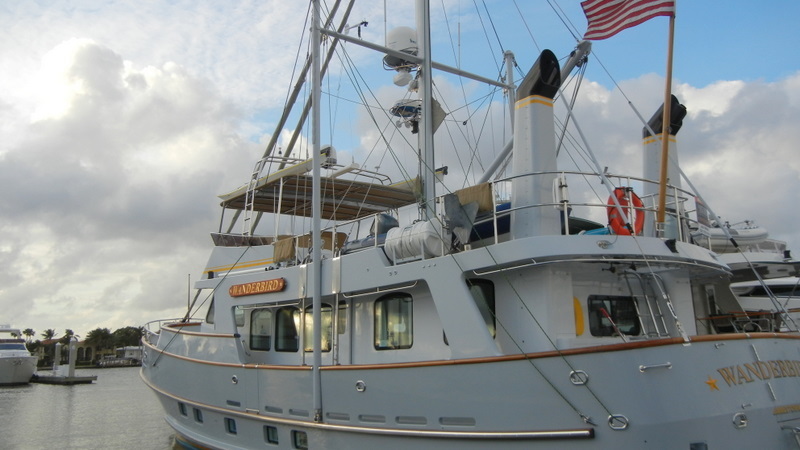 By far the most spectacular trawler for sale was the Wanderbird. I wish I could have taken photos inside it is magnificent. It was build in Victoria BC for an owner that just enjoyed the construction project. I was told he spent $12M on it. It's for sale at $3.5M. A real bargain for anyone with that many millions to spend on boats. The galley was across the stern, a very unusual positioning. The boat was loaded with original paintings many of boating scenes. Some were really beautiful. It had beds for 6 and a crew quarters forward for 4. The height was like a sailboat with a really tall mast and what appeared to be two roller reefed steadying sails forward. Midship were large flopper stoppers. Aft were two large dry stacks for the engines that made it look like a cruise ship. . . which it is. It is not a loop boat because of the height, but if you want to go to Australia this would be the boat.